• There are 182 rooms and 32 suites. Restaurant Lesage, Karl May Bar and Café Vestibül. • 10 conferences room for up to 800 people, spa lounge with a pool. • Located in the historic inner city center of Dresden. Surrounded by the most famous sights of Baroque style in Dresden the Semper Opera House, the Zwinger Palace and the Royal Palace. • 1705-1708: Palace built by Johann Friedrich Karcher as a present from the King August the Strong for his mistress Countess Anna Constanze von Hoym. • 1713: The Countess fell into disgrace and was banned from the Palais. • 1715: The Palais was redecorated in an oriental style and was called « Turkish Palais ». • 1717: Extension of the Palais through Matthäus Daniel Pöppelmann and Raymond Leplat. • 1747-1750: Extension through the architect Johann Christoph Knöffel. • 1854-1857: Last extension of the Palace. • 1934: Renovation of the Palais..
• 1945 February 13: Destruction during the massive Allied bombing raid over Dresden. 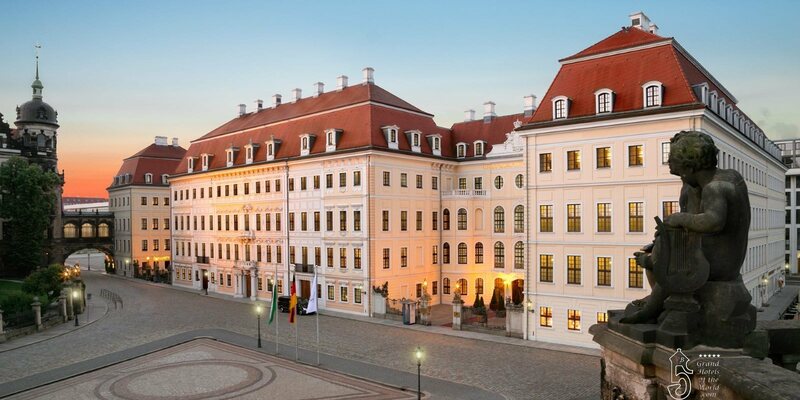 • 1995 March 31: Opening of the Palais as the first 5 star Hotel in the German state of Saxony under the management of the prestigeous Kempinski Hotel Chain. • Ownership: Hotel Taschenberg Betriebs GmbH. • General Manager: Mr Marten Schwass. Kempinski is Europe’s oldest Luxury Hotel Chain and has a fascinating history. The company has brought back to life many iconic Grand Hotels with a legendary past. Kempinski was founded in Berlin by Berthold Kempinski. • 1872: Mr Kempinski started with a wine bar to which was soon added different restaurants. Berthold Kempinski’s son-in-law Richard Unger continued the business. • 1897: Foundation of Berlin Hotel Betriebs AG. • 1918: A Kempinski hotel dependency was established at Kurfürstendamm 27 Over the years the Kempinski family owned an impressive portfolio of Berlin restaurant and hotel properties. • 1937: The Nazis stole all properties from the Jewish Kempinski family. The Kempinskies were either killed or they emigrated to the US. After the war Kempinski’s grandson Friedrich Unger Kempinski returned to Germany and rebuilt Hotel Bristol on Kurfürstendamm 27. • 1953: Friedrich Unger sold the Hotel Bristol and the Kempinski name to Hotel Betriebs AG, an Aktiengesellschaft which started the International Hotel Business from West Berlin with the Bristol. • 1957: Hotel Atlantic in Hamburg is aquired by Kempinski and becomes the second Kempinski Hotel. • 1970: Kempinski buys parts of Hotel Vier Jahreszeiten in Munich (more shares are bought later) from the Walterspiel hotelier family. The Vierjahreszeiten becomes the third Kempinski Hotel. • 1983: Lufthansa buys parts of Kempinski from Dresdner Bank and Commerzbank. • 1992: Opening of Hotel Baltschug in Moscow. • 1992: Lufthansa and others sold their shares to the King of Thailand via his Crown Property Bureau. Over the years the initially very German hotel company became more and more International, with the HQ moving to Geneva and hotels opening in multiple countries. • 1995: Opening of the renovated and reconstructed Taschenberg Palais in Dresden. • 1997 August 27: Opening of the reconstructed Hotel Adlon in Berlin. • 1999: Opening of the renovated Ciragan Palace in Istanbul and the renovated Grand Hotel Falkenstein near Frankfurt. • 2002: Opening of the renovated Grand Hotel des Bains in St Moritz.